Looking for the perfect Christmas gift to wow those special people in your life? Well, look no further, because I have an oh so easy recipe for delicious and festive Cranberry Infused Vodka that will jingle your bells! Edible gifts from the kitchen have long been a very personal and traditional way to celebrate the holidays with Christmas cookies and candies and other yummy homemade treats. But this year, why not spread some holiday cheer and give a delightfully unique gift that will be remembered and appreciated long after the holidays are over? Oh, and while you are at it, be sure to make a batch yourself! 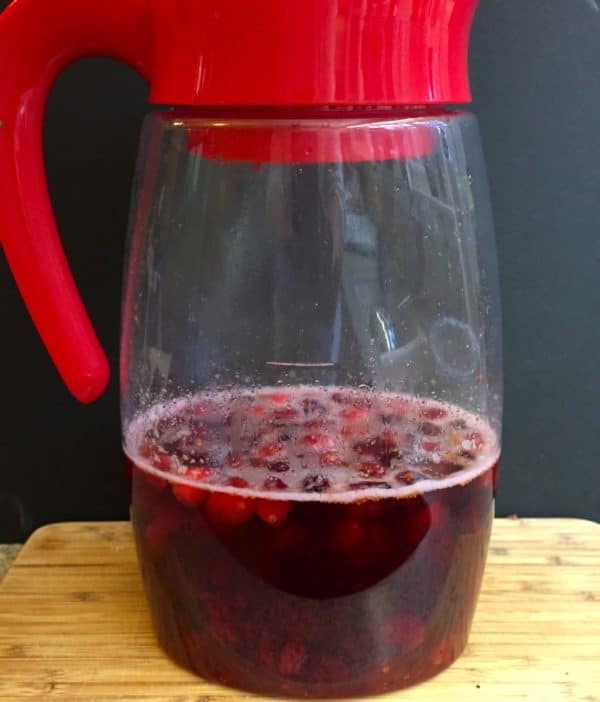 Cranberry Infused Vodka only takes about 15 minutes to make and makes a gorgeous gift with its deep Christmasy red color packaged in a beautiful decanter or festive jar. You could also include a card with servings suggestions like Cranberry Vodka Martinis or Cranberry Cosmopolitans. The possibilities are endless. While you are here, be sure to check out these other easy and unique, edible holiday gift ideas, Preserved Lemons and Mixed Olive Tapenade. 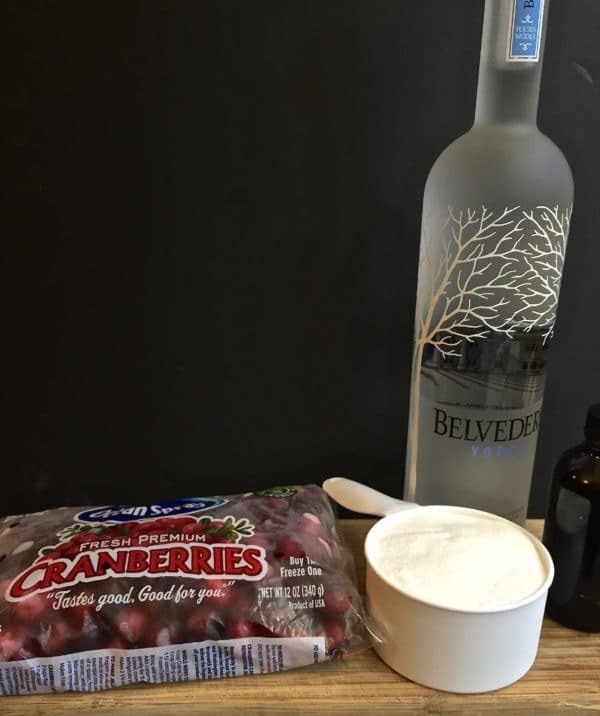 There are only four ingredients to Cranberry Infused Vodka, and it only takes a few simple steps to prepare. 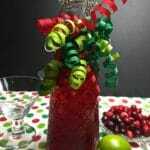 The ingredients are fresh or frozen cranberries, granulated sugar, vanilla extract and a bottle of vodka. *Once you prepare the cranberry mixture, it does have to sit for one week to infuse the vodka, so be sure to plan ahead for this. To make Cranberry Infused Vodka, place cranberries, sugar, vanilla extract and 1 Tablespoon of water in a medium saucepan over medium heat. Stir frequently and let the mixture simmer for about 5 minutes or until the berries have burst. Let the mixture cool a few minutes, pour the mixture into a large pitcher and add the vodka. Mix well. Cover tightly and let sit in the refrigerator for one week. After one week, strain the mixture to remove the cranberries using a small mesh strainer and then store the cranberry infused vodka covered in the refrigerator. To serve, use your favorite cocktail recipe or simply pour a little of the cranberry vodka over ice and add tonic water to taste. Garnish with a slice of orange, lemon or lime and enjoy! 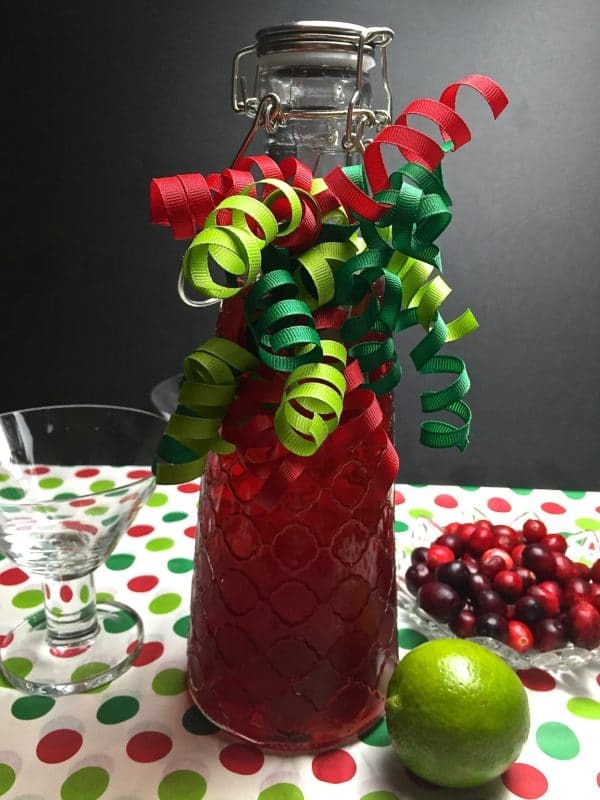 Cranberry Infused Vodka only takes about 15 minutes to make and makes a gorgeous gift with its deep Christmasy red color packaged in a beautiful decanter or festive jar. 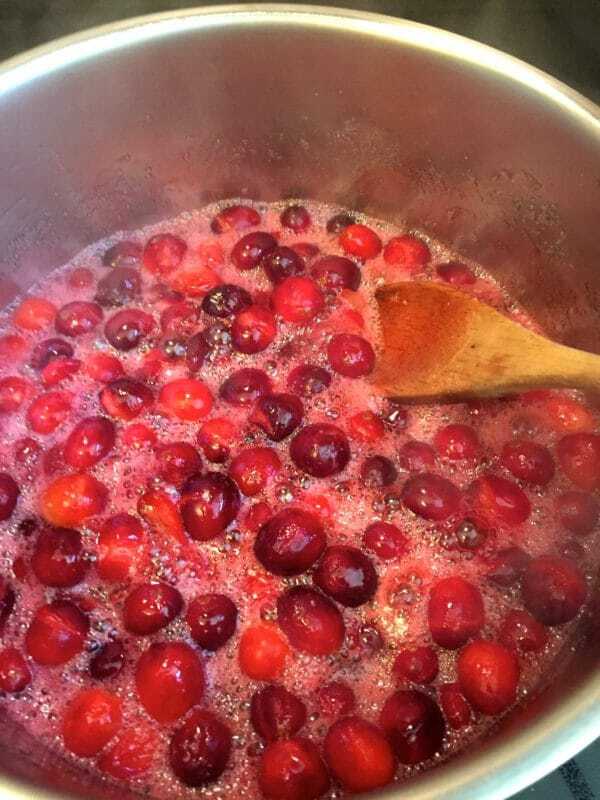 Place cranberries, sugar, vanilla extract and 1 Tablespoon of water in a medium saucepan over medium heat. Stir frequently and let the mixture simmer for about 5 minutes or until the berries have burst. Pour the mixture into a large pitcher and add the vodka. Mix well. Cover tightly and let sit in the refrigerator for one week. After one week, strain the mixture using a small mesh strainer and then store the cranberry infused vodka covered in the refrigerator. A fifth of liquor is 750 ml which is 25 3/5 ounces. The cranberries do soak up some of the vodka so you will end up with about 24-25 ounces. Hope this helps! Does it have to be refrigerated? Can I let it sit at room temperature or in the basement or garage for a week? Also, can it sit longer than a week? Yes, I would definitely refrigerate it! I have only let it sit for a week so can’t really speak to how it would work out if you leave it longer. Sorry! Regarding the refrigeration, I’m giving this as a gift. Should I instruct people to keep it refrigerated after using it? Thanks! Yes, I would either put a note on the card or simply tell them. Hope they enjoy it!